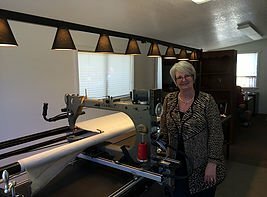 At Bear Country Quilts & Gifts we offer the finest quilting with our Gammill Statler Stitcher long arm quilting machine. 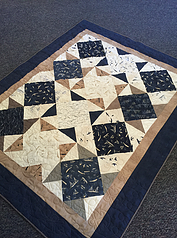 If you have a few projects started but just don’t know how to finish them, let us help you bring your quilt to life. We can enhance your beautiful top, no matter what size it is, with our large selection of quilting patterns. Let us turn it into a beautiful quilt with all the finishing touches. Your top needs to be squared, pressed and free of excess threads. 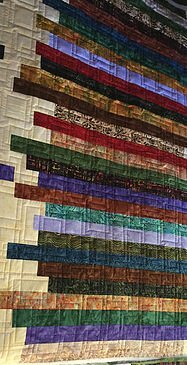 Please mark the top of your quilt with a piece of masking tape…. Stating top. The backing should also be squared, pressed and have the selvedges removed. Backing should be at least 4” larger on all four sides and squared. It is necessary that your backing be squared up (top & bottom) The extra backing is needed for loading the quilt on the quilting machine. There are clamps that are attached to the backing to keep it taut and smoothed out. 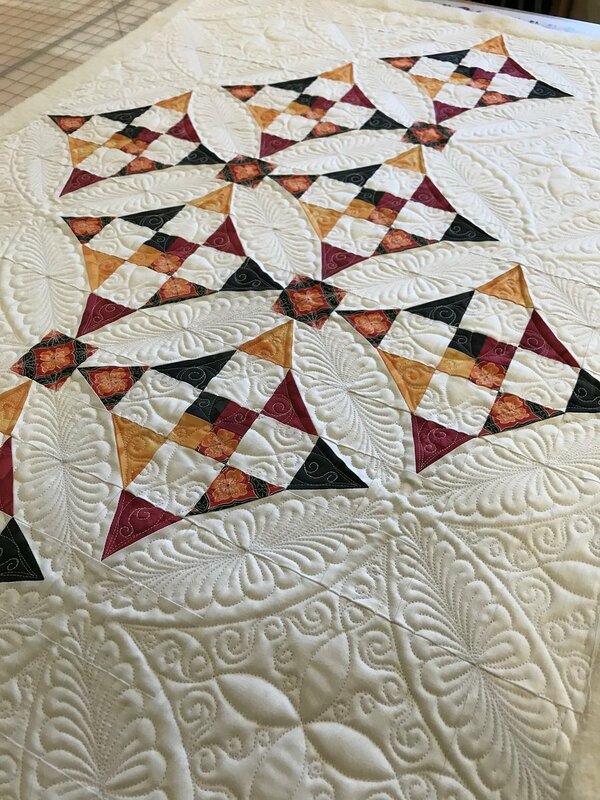 A word of caution about pieced backing: Piecing your backing from leftover from the top of your quilt is a great way to get rid of excess fabric and looks very pretty on a quilt…. But if not done correctly can cause huge problems for the quilt. When piecing your back, be sure that you cut the fabric along the grain lines. If done incorrectly piecing of your backing can have “saggy” spots that keep it from lying flat. This can cause fabric tucks that are quilted into the back of your quilt, which cannot be prevented. Batting (if you supply) should also be at least 4” larger on all four sides and squared up. Both top and backing should be carefully pressed with seams open or going to one side. Top and backing should lie flat. Quilt top and backing should be free of loose threads. Remove all pins, buttons, or other embellishments. Before you bring in your quilt to be quilted, lay it on a flat surface and make sure your borders lie flat. Measure the outer edges of your quilt, as compared to the measurement taken about 10” down from the outer edge. If the outer edge is more than an inch or two bigger than the inner measurement you have created a wavy border. 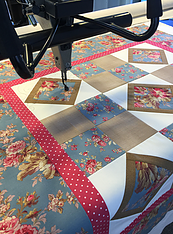 Quilts with wavy borders or other areas will not lie flat require extra work that WILL result in extra charges. If bring your top, back and batting to the shop please have top and back folder and on a hanger. Put a beautiful finishing touch on your quilt with our custom quilting, or edge to edge design. Crib 40 x 55 2,200 sq. in. Twin 65 x 85 5,525 sq. in. Double 80 x 88 7,040 sq. in. Queen 86 x 93 7,998 sq. in. King 104 x 93 9,672 sq. in. We use only quality Cottons, Polyesters, Egyptian, Variegated, and Monofilament threads. Calculate by multiplying the width of the quilt in inches by the length. Customer supplies the fabric, pricing per linear inch. hand finishing the binding to the back with mitered corners.